Singles Knockout winner - Ian Russell (taken from the Trophy). Doubles Knockout winners - Alec Bain & Dave Lyth (taken from the Trophy). Heaviest Fish in a competition - William Atkinson - 11 lb 10 oz - Wednesday 18th February 1987. Christmas match winner - Denis Thompson - 23 lb 11 oz - 13 fish. Christmas match Heaviest Fish - Dave Cass - 10 lb 14 oz. Greatest number of fish - Denis Thompson - 249 fish. Heaviest Bag of Fish - Les Spedding - 33 lb 06 oz - 18 fish - Wednesday 3rd December 1986. 1st - Rob Johnson - 3 lb 04 oz - 1 fish. 2nd - Neil Inglis - 2 lb 04 oz - 1 fish. Total weight for the season - 3,056 lb 11 oz. Total Number of fish - 2,218. All seasons results entered into an Excel spreadsheet & updated 31st July 2013 PDH as a record claim was made by D Thompson for season's record weigh-in. Notes:- PDH 14/12/2012 from ledger. Seasons totals are not in the ledger (see above). 17th September 1986 - P Kilpatrick 1 billet of 3 lb 00 oz. 26th October 1986 - Ian Russell 1 fish for 5 lb 14 oz, part of a 24 lb 00 oz bag. 2nd November 1986 - Denis Thompson 1 fish for 8 lb 07 oz, part of a 21 lb 01 oz bag. 23rd November 1986 - WSAA Annual Open Match, 8 WSAA members weighed in. 3rd December 1986 - Les Spedding Heaviest bag - 33 lb 06 oz - 18 fish. 7th December 1986 - Day Match - Cloughton Open - 9 members weighed in. 21st December 1986 - Christmas Match - Heaviest Fish Dave Cass 10 lb 14 oz, winner Denis Thompson 23 lb 11 oz. 4th January 1987 - Ian Russell , haddock of 1 lb 12 oz, part of a 12 lb 06 oz bag. 1st February 1987 - Bell Trophy - 14 members entered - 7 weighed in. 15th February 1987 - Hayburn Wyke Match 10am - 3pm - 11 members entered - 5 weighed in. 18th February 1987 - William Atkinson 1 fish for 11 lb 10 oz. 1st March 1987 - Bass Open Match - 11 entered - 10 weighed in. No total weights recorded in ledger. Match 1 - 15 fished. Match 2 - 15 fished. Match 3 - 16 fished. Match 4 - 15 fished. Match 5 - 14 fished. Match 6 - 15 fished. Match 7 - 16 fished. Match 8 - 14 fished. Match 9 - 15 fished. Match 10 - Day match - 6 fished. Match 11 - 14 fished. Match 12 - 15 fished. Match 13 - 16 fished. Match 14 - 16 fished. Match 15 - 14 fished. Match 16 - 14 fished. Match 17 - 17 fished. Match 18 - 15 fished. Match 19 - 16 fished. Whitby Sea Anglers held its annual open competition with 131 anglers taking part despite westerly gales. Twenty eight anglers caught fish and following the weigh-in, at the Pier Hotel, cups and prizes were presented by Mike Russell, from Blue Star Angling, the main sponsor for the event. The winner was local angler Denis Thompson, who caught three codling, just beating Barry Wood, of Scarborough. In third place was A Dixon, of Scarborough, whose single codling also took the cup and sweep for the heaviest fish. The second heaviest fish was tied between D Thompson and E Spencley. The prize for the heaviest fish other than a codling, fell to R Slater, of Scarborough. Everyone who weighed-in won a prize from the large selection which had been donated by various local businesses. In WSAA's own competition D Thompson won with 10 codling, followed by P Horbury. Wednesday 19th: 1 D Thompson 13 lb 11 oz; 2 P Horbury 9 lb 05 oz; 3 P Hoy 8 lb 09 oz. WSAA Open Sunday: 1 D Thompson 7 lb 12 oz; 2 B Wood 7 lb 06 oz; 3 A Dixon 6 lb 12 oz; 4 M Breckon 5 lb 04 oz; 5 E Spencley 4 lb 15 oz; 6 P Hoy 4 lb 14 oz. Heaviest fish: 1 A Dixon 6 lb 12 oz; joint E Spencley D Thompson 4 lb 15 oz. Heaviest other fish: R Slater 2 lb 04 oz (wrasse). The small tides and calmish sea conditions on wednesday, last week, made for very poor results and only five of the 16 anglers caught anything. The winner was P Kilpatrick with five small codling. On Sunday 30th, there was just a steady movement on the sea and this, combined with the bigger tides, improved the results greatly. The winner was D Perrett with a bag of 12 codling weighing 16 lb 07 oz. Second place went to I Russell with 11 codling for 13 lb 12 oz, just beating L Spedding who had 11 codling for 13 lb 11 oz. Wednesday, 26th November: 1 P Kilpatrick 6 lb 06 oz; 2 W Atkinson 4 lb 11 oz; 3 D Perrett 3 lb 03 oz. Sunday 30th; 1 D Perrett 16 lb 07 oz; 2 I Russell 13 lb 12 oz; 3 L Spedding 13 lb 11 oz. A Bain beat N Brittain. A Bain and D Lyth beat N Brittain and I Russell. Match 20 - Whitby Open Match (no record of how many members fished). Match 21 - 16 fished. Match 22 - 16 fished. From Whitby Gazette press cutting above. 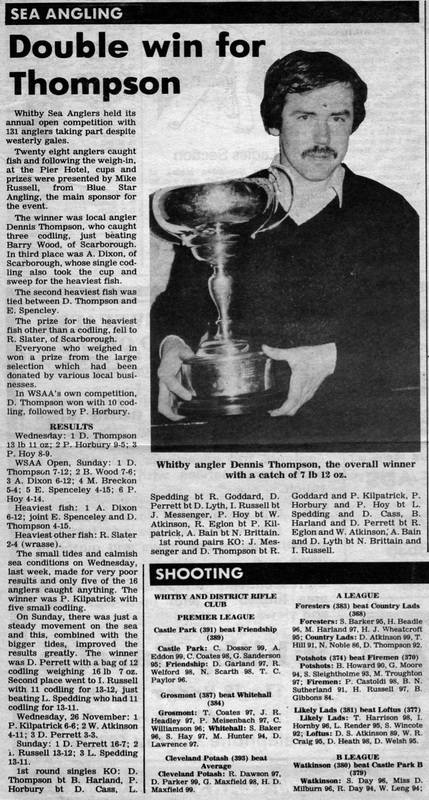 1st round of the singles KO - taken from Open press coverage in Whitby Gazette above. A Bain 5 lb 05 oz bt N Brittain 0 lb 00 oz. J Messenger 4 lb 00 oz and D Thompson 11 lb 00 oz beat R Goddard 1 lb 01 oz and P Kilpatrick 3 lb 09 oz. P Horbury 11 lb 01 oz and P Hoy 9 lb 01 oz beat L Spedding 13 lb 11 oz and D Cass 3 lb 05 oz. B Harland 6 lb 01 oz and D Perrett 16 lb 07 oz beat R Eglon 7 lb 15 oz and W Atkinson 5 lb 00 oz. A Bain 5 lb 05 oz and D Lyth 11 lb 15 oz beat N Brittain 0 lb 00 oz and I Russell 13 lb 12 oz. Match 23 - 16 fished. Match 24 - Cloughton Open Match (no record of how many members fished). Match 25 - 13 fished. Match 26 - 13 fished. Match 27 - 13 fished. 162 lb 07 oz Total weigh in. Dave Cass Heaviest Fish 10 lb 14 oz. Match 28 - Christmas Match - 16 fished. Match 29 - 16 fished. Match 30 - 14 fished. Match 31 - 14 fished. Match 32 - 12 fished. Match 33 - no record of how many fished. Match 34 - 14 fished. Match 35 - 14 fished. Match 36 - 14 fished. Match 37 - Bell Trophy - 14 fished. Match 38 - 14 fished. Match 39 - 14 fished. Match 40 - 15 fished. Match 41 - Hayburn Wyke Open (day match) - 11 fished. Match 42 - 14 fished. Match 43 - 11 fished. Match 44 - 14 fished. Match 45 - Bass Open (day match) - 11 fished. Match 46 - 13 fished. Match 47 - 11 fished. Match 48 - 11 fished. Match 49 - 11 fished. Match 50 - 12 fished. Match 51 - 11 fished. Match 52 - 13 fished. Match 53 - 11 fished. 7th - Dave Perrett with 1 fish for 1 lb 1/16oz. There is no record of members who fished either the WSAA Open or the Cloughton Open (day match) who did not have a weigh in. 1986 - 1987 was a 53 match season. Re edited 28th Jan 2014. Re edit 24th Feb 2014.